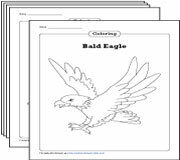 This extensive collection of worksheets is designed for kids of grades 1 through 7, teaches the significance of national symbols and monuments created to remember milestones or to honor people. 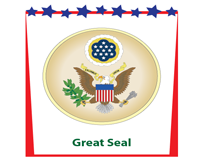 Charts, flashcards and activities like identifying and labeling U.S. symbols and monuments; exercises on the American flag, great seal, pledge, bald eagle, etc; reading comprehensions on Mount Rushmore, Capitol Hill, Liberty Bell, and a multitude of coloring worksheets have been included here. 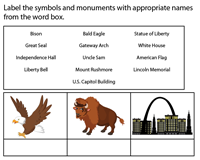 This visually appealing show-and-tell chart designed for kids of grades 1 and 2 helps identify the U.S. symbols and monuments with ease as kids try and make an association between the names and the images and improve memory with repetition. 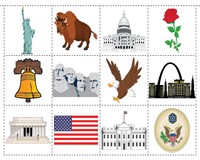 This assemblage of 16 coloring worksheets featuring American symbols and monuments is apt for children of grades 1 through 5. Enhance creativity and fine motor skills and learn to recognize the symbols and monuments in the process. An interesting eye-catchy worksheet created for kids to identify the symbols and monuments and label the images using words from the word box. Serves best in testing recognition skills of grade 3 kids. Snip the images, sort them as symbols and monuments and glue them in the appropriate columns of the T-chart presented in this worksheet for kids of grades 1 and 2. Instantly reflect on what you have learned with this MCQ worksheet. 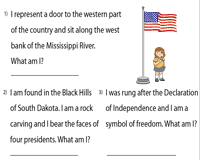 Direct kids to keenly observe the images, identify the 9 U.S. symbols and monuments and check the correct option and gauge kids' knowledge and recognition skills. Flashcards are an effective way to study and retain factual knowledge. 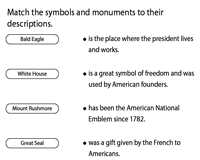 Cut out each card with the images and descriptions of each symbol and monument and improve student engagement and memory with this batch of attractive flashcards. 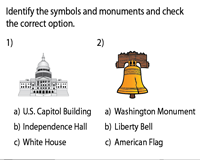 How well do you know the symbols and monuments? 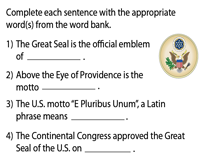 Test your knowledge with this matching worksheet. Read the description carefully and identify the symbol or monument referred to and make a one-to-one correspondence between them. 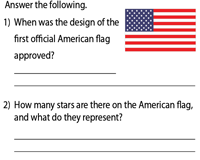 Brainstorm kids to assess prior knowledge of the American flag. Let kids research and gather information about the flag and figure out answers to the who, when and what of the flag and find out what each color and component signifies. 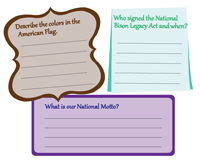 Test general knowledge and assist kids in learning a little more about the national mammal, the national tree, the national flower, the national flag and the national motto by answering simple questions in this worksheet for kids of grades 4 and 5. How much do you know about the majestic bird? Let children recall from memory of what they know, to answer this quiz on American Bald Eagle, the national bird of America and append some interesting facts to their knowledge. 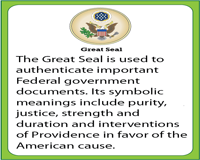 Specifically dealing with the great seal, this third-grade worksheet presents important facts associated with the great seal. Read the sentences carefully and complete them with words from the word box. Mornings begin with standing, hand over heart, to recite the Pledge of Allegiance to the U.S. flag. Employ this chart and memorize the words of the pledge, recite it each day and demonstrate respect for the national flag. 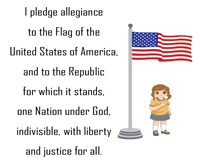 This worksheet is based on the pledge of allegiance. Assess memory of grade 2 and grade 3 kids as, they complete the pledge of allegiance with words from the word bank. Learn the words of a key patriotic exercise in the process. Have you ever observed the coins? Do you know which symbol or monument is depicted on the coins? 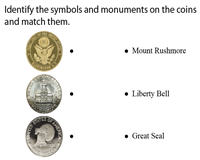 Check if grade 2 and grade 3 kids are able to identify the symbols and monuments on coins and connect them to their names. 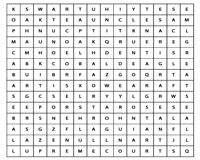 The objective of this puzzle is to find and mark all the national symbols and monuments hidden in the grid horizontally or vertically. Kids of grades 2 and 3 learn new words and their spellings by intensively searching for them, letter by letter, in the puzzle. U.S. Symbols and Monuments | What am I? Can you guess which monument or symbol is described in each 'What am I?' riddle featured in this worksheet? Create lots of fun with this intellectual challenge as grade 3 and grade 4 kids identify the symbols and monuments and review knowledge. How about a trip to Mount Rushmore? 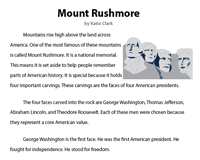 Know the how, why, when and many other facts of Mount Rushmore. Test comprehension of grade 6 students with the exercise worksheet. The U.S. Capitol Building, its design, construction, neighborhood and the like are explained in this passage created for grade 7 students. Read the passage and answer the questions that follow. 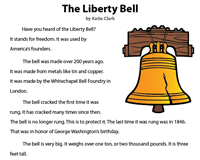 Read about this iconic symbol the Liberty Bell, how it was made, its crack and other important facts about the bell with this passage. Included here are a variety of exercises to gauge understanding of grade 2 kids.